Sometimes indulging in a bit of luxury is good for the soul. When we booked our Airbnb in Jodhpur, our idea was to do a budget travel. Of all the places, the one homestay that really surpassed all my expectations was Pushp Guest House. Located in the heart of the old blue city, right below the fort walls of Mehrangarh, it was the perfect location for us. But How is Pushp Guest House connected to the Luxurious Bristows Jodhpur? The owners of Pushp also run an independent luxury property which is a short 2-minute walking distance from Pushp. Amid all the hustle bustle of the old blue city, lies a serene abode in the midst of dense lush green all around. It’s an escape from the reality of the outside environment. One step into the property, and you can’t really tell where you are other than the majestic Mehrangarh as your primary view. It is a one of a kind luxury destination in Jodhpur. Here you can get your privacy and enjoy a 360-degree view of the old blue city 24/7. The house is designed keeping in mind the old heritage of the city. It’s all blue walls all around with a gorgeous traditional decor inside. Each of the rooms comes with its own bits of quirkiness and a direct pass to the main courtyard garden. The rooms are tastefully designed with careful detailing highlighting the local artisans’ craftwork. Nikhil Mathur is the primary owner of this place. He has built this up along with a British counterpart and together they have designed this beautiful property. Nikhil is a fantastic host who takes immense pride talking about this heritage property. 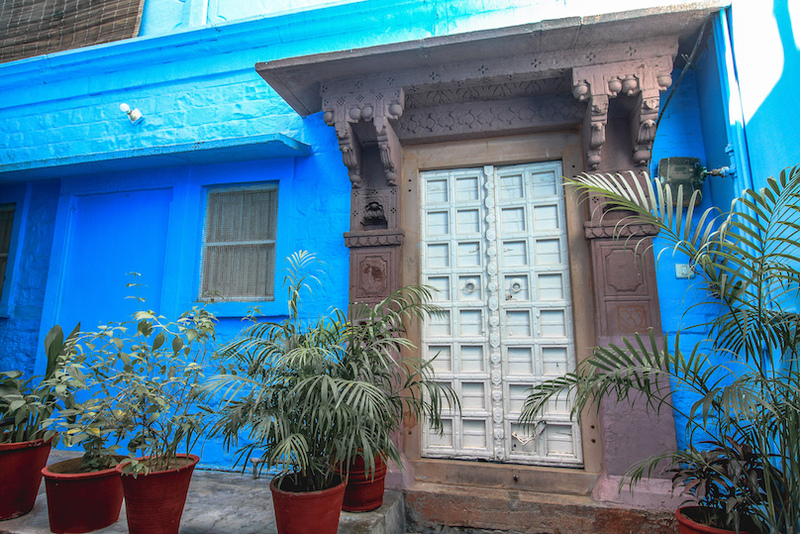 For as long as I can remember, I have had a love affair with Jodhpur the blue city. It started many years ago in my home town of Tetbury. Sitting one day in the barbers shop, I picked up a National Geographic magazine to see that the main feature on Jodhpur. It had a full page picture taken from the fort looking down on the Blue City. I was captivated by this biblical image. I tore the page out and pasted it into my scrap book little knowing that 50 years later I would own one of those havelis in the photograph. What you need to note at this point is, water is extremely precious in the old blue city. Tankers come every alternate day which means you can imagine how difficult it is to maintain a full-fledged garden! After a little chit-chat with our gracious host, we came to know that he painted the property and the adjoining street all blue by himself. Such was the dedication to set this place up for lucky tourists like us to enjoy. Ask him about the artefacts he has collected over the years and with great pride, he gives out the details of his vendors. But the one thing I am especially thankful to our host is for giving his valuable recommendations about Panchkunda – an old historical site of the royal cenotaphs. Nowhere on the internet can you find information about this beautiful ancient site, and what a site it was. You just have to see it to believe it. Probably the best part about Bristows Haweli, the terrace provides a vantage point to soak in amazing old city views. Not to mention, the magnificent Mehrangarh Fort as the backdrop. You can spend hours here just soaking in the beauty all around. What does it cost to stay at Bristows Haweli, Jodhpur? Every suite comes with a different pricing. Depending on the season, the prices fluctuate anywhere from INR 5000 upwards. You can book this place using any of the travel hotel booking websites. For more details, here’s a link to their official website. Is This The Most Beautiful Street In Cape Town?